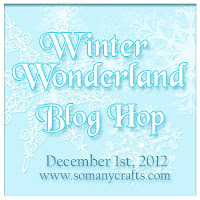 Welcome to the Winter Wonderland Blog Hop, brought to you by the Krazy Crafting Crew. 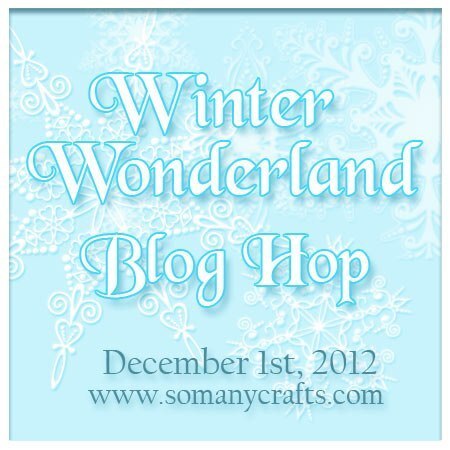 This is our last monthly hop of the year as we celebrate the holidays, say sayonara to 2012 and welcome in a year that's bound to be great and full of crafting! We in the KCC have had a wonderful year with fun themes; have you noticed? Would you like to join us? Just let me know in your comments and I'll hook you up! :) We're having lots of fun themes, sponsored blog candy, and more in 2013. Today, the KCC will be bringing you all sorts of wintry projects including our holiday cards. Bottom: The full eight-panel accordion card, unfolded. double as a mantle's home decor for the holidays. Like what you see? Be sure to hop along. I'm the second stop, right after our hostess Lissa Marie at So Many Crafts, So Little Time. I will post the full blog roll below. Your next stop is the fantabulous JAMIE at Jamie Lindstrom Designs -- she always has some fun projects, so don't delay. BUT WAIT!!! 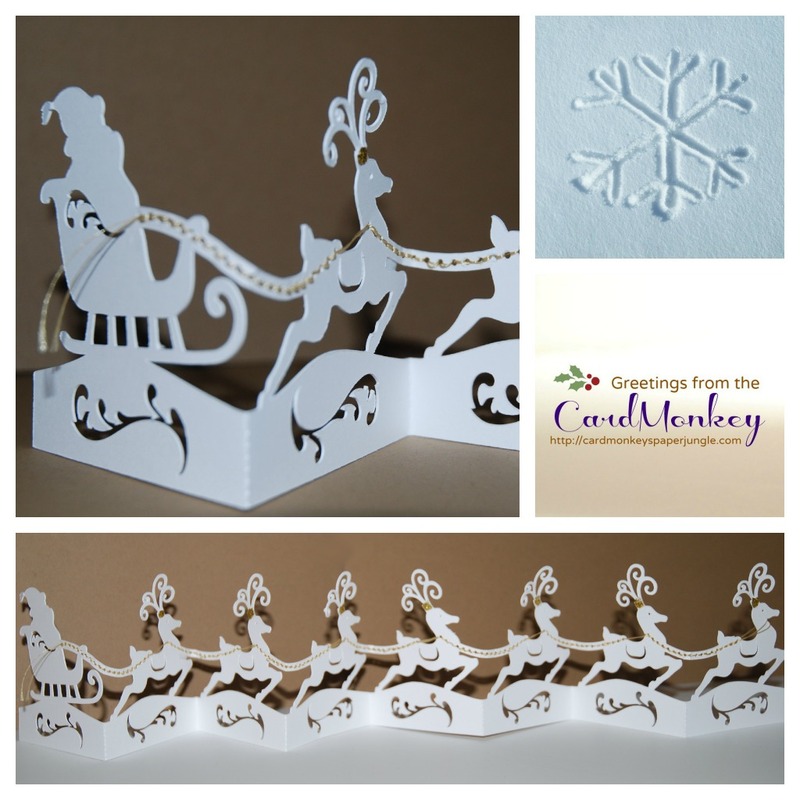 Before you go, Santa's arrived a bit early and dropped off this fun Designer Card Kit from Momenta which could be yours if you win the CardMonkey blog candy! Be a follower here and state as much in a comment on this blog post here. In your comment, I'd like you to tell me what you'd like to find in your crafter's Christmas stocking (under $20) .... can you tell, I'm looking for some ideas for my Secret Santa gift for a fellow crafter? Do tell me, too, how to contact you when you win the Momenta Card Kit! Other bloggers have blog candy throughout the hop too ... so be sure to stop by and read the candy requirements on each. For example, your host Lissa Marie is giving out a mini calendar to those who are followers of her blog (confirmation is required or she won’t see that you have signed up if you are new). She will make the calendar just for you to help you schedule your appointments or if you are a blogger you can schedule all your hops all right next to your monitor! All you have to do is tell her your favorite colors! 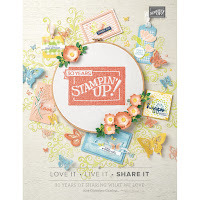 Another great reason to comment is so you can also win with our monthly sponsor, Scrapbook Stamp Society (http://scrapbookstampsociety.com/). Thank you for taking the time out to check out my projects. Please do click on for more joyous Winter Wonderland. Remember, your next stop is JAMIE, at www.jamielindstromdesigns.com. AMAZING!!!! I just love the Santa cut! I'd like to find cute themed colorful brads in my stocking! Love this and will definitely have a go at making it...next year! LOL! Thanks for sharing! Great project. Intricate cutes. I am a follower. For under $20 I would like a pick me up tool. It would be so handy for those little pieces. I also want to try glitter T shirt vinyl. Thanks for the chance to win. I love this Santa Card! It's not fair that you have so much talent. You need to pass some of that off to me. I had fun looking at your other cards too and same thing, give me some of that talent there girlie. It's great as always to hop with you. Very cute Ellen! I love what you did with the cut. as for your questions, I love embossing folders, sew easy stuff, buttons. You could do a grab bag of smaller items to add up to your $20! Oh my gosh! I know I talked to you but I always make it a point to comment on the blog as well! Well I have two complements for you! I love your intricate cuts on your card and the card below... wow simply beautiful! Thank you Soooooooooooooooooooooooooooooooo much for being such a wonderful dedicated participant of KCC this year, you are amazing and I love having you as a friend as well. Even though your printer is bigger and better then mine and you have a cameo and I don't! I still am so honored that you are a part of KCC! Looking forward to another year with you! Love ya! Hi i follow you via GFC and email...under $20? i'd like a small Xyron sticker maker, but not sure how much they are, so maybe more paper! Thanks for sharing your Winter Wonderland. that card is gorgeous! such intricate cutwork! Whoa...that is some card! 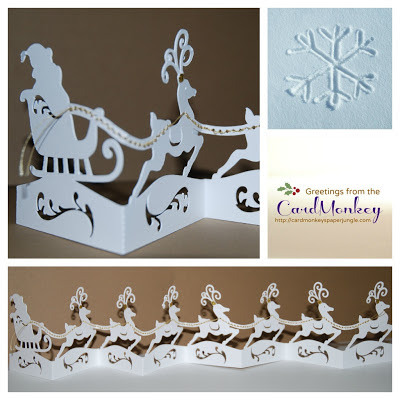 Gorgeous die cuts and I love the all-white color scheme! I am a blog follower and I am hoping to find some embossing folders under the tree this year since I finally got a Big Shot! I have been a follower for quite a while. I am looking forward to more embossing folders and dies. Of course I am a card maker and so anything I can use on a card is always welcome. 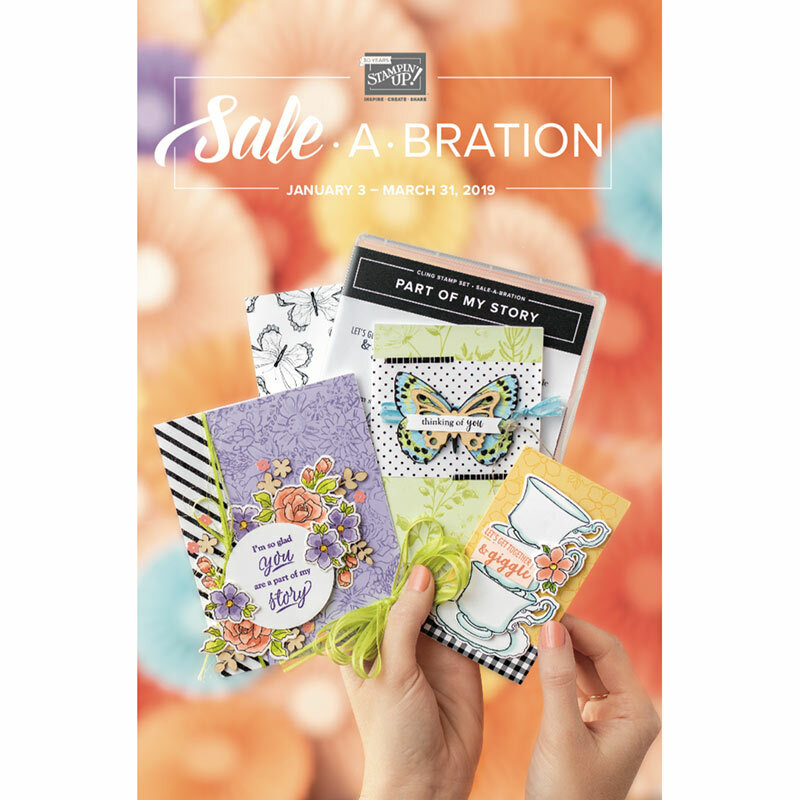 Things under $20 I'd like to see in a Secret Santa gift if I got one would be embossing folders, stamp pad ink refills (especially Stazon black), Micron pens, sponge daubers, adhesive, cutting mat for whatever machine they use.